Learn about the struggle for Independence, the arguments over Constitutional ratification, slavery and Civil War, westward expansion, America's evolving role in world affairs, and the continuing march toward a more pluralistic society. 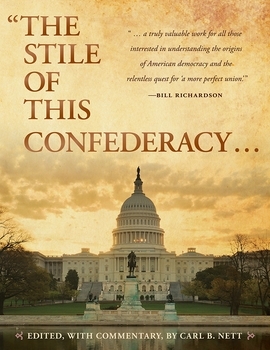 "The Stile of This Confederacy..., edited, with commentary, by Carl B. Nett, seeks to foster an informed patriotism through historical literacy. Gathered within are the documents, speeches, declarations, poems, arguments, and songs that have shaped centuries of American life. Here, readers are introduced to the very people who influenced and guided our country's formation — in their own words, rather than an interpretation of their words. With insightful commentary that precedes each selection, this full-color, 544-page history of the American republic is further brought to life by the inclusion of more than 80 high resolution illustrations interspersed throughout the book. With a foreword by Benjamin Smith, former U.S. Navy SEAL, "The Stile of This Confederacy... reinforces those old-fashioned, indeed timeless, lessons — that nothing worthwhile comes without struggle; that difficulties and injustices, however daunting, must be overcome by patience and perseverance; that worldly success is meaningless without a moral foundation. Carl Benjamin Nett is a former federal officer of the United States Secret Service, with assignments to the Dignitary Protective Division and the Presidential Protective Division. He served on more than one hundred protective details, both at home and abroad, in support of President George W. Bush and then presidential candidate Barack Obama. He has since served in the Intelligence Community supporting the mission of the Central Intelligence Agency in the global war on terror, to include temporary duty in Afghanistan. Nett has a Bachelor of Arts degree in history from American Military University. He and his wife divide their time between Louisville, Kentucky and Alexandria, Virginia.